The attack came as Washington runs out of patience with Islamabad’s refusal to reopen supply routes for Nato troops in Afghanistan. US drone strikes have complicated negotiations over the routes, which Pakistan closed six months ago in retaliation for US air strikes that killed 24 Pakistani soldiers along the Afghan border. Pakistan’s parliament demanded the strikes stop after the attack, but the US refused. Security sources say over 92 per cent of Orakzai has been cleared of militants in the ongoing military operation in the region. 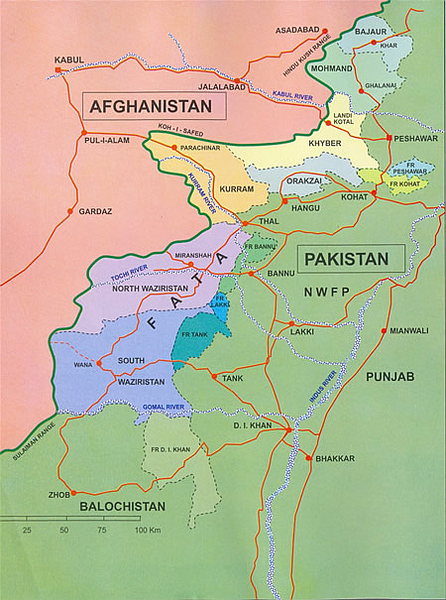 Moving on to clear North Waziristan would go a long way toward breaking the diplomatic standoff, but would require breaking what many accuse to be close relations between the Haqqani network and elements of the ISI. At any rate, with the added insult of a new drone strike, don’t look for the supply routes to reopen this week. Hm. Committing an act of violence in order to get your way politically. I wish there were a simple label for that. @MadDog: And btw, it wouldn’t surprise me if Petraeus was one of those instrumental in attempting to “teach Pakistan a lesson”. Again! From all that I’ve read, as the former top US military officer in Afghanistan, Petraeus never had a warm and fuzzy relationship with the Pakistanis. I rather doubt that his move over as the CIA Director made him any more sanguine in his dealings with Pakistan. How soon before Zardari is assassinated and who will his replacement be? Certainly not the 235,000 IDPs who’ve flooded into and through Jalozai refugee camp. They aren’t fleeing drone strikes, at least not by their own accounts. War is about suffering, I’m not stating anything new. Count out the suffering, and then try, just try, to state something very obvious about what’s going on. 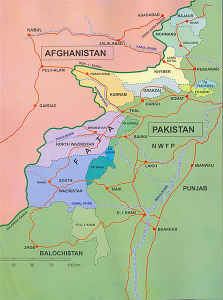 This always has been Pakistan’s proxy war, not the U.S.’s. In the early days, when we were first opening Guantánamo, the ICRC complained that we had no right to detain under the law of armed conflict because we weren’t party to the conflict. Because we had no armed forces on the ground. And even at that point, there were 3.5 million Afghan refugees. Do you understand, Jim? The Pakistanis use the drone issue to deflect criticism in their press. That doesn’t make our use of drones moral, it doesn’t make it right or wrong, it doesn’t make our participation in the war over there right or wrong or argue for or against what we should or shouldn’t do. But the Pakistani ISI, military, and government finds it convenient to proxy Afghanistan, and to develop insurgents there. And to develop insurgents against India. And when all that militancy turns on them and creates the TTP and its supporting political parties, then it masks how poorly it’s doing against the TTP in its military campaigns and its losses by raising public anger against the drones. So it’s not surprising that on a day when 12 people die from F-18 attacks and 4 from drones, and another 400-1000 register at Jalozai, the anger is about the drones.